A complete suite of system modules providing an End to End agency information systems solution eliminating the need for multiple back-up spreadsheets or auxiliary data files. The system had its beginnings in 1988 and is now on release # 14. It was developed in Wisconsin for Wisconsin Agencies and is compatible with the State of Wisconsin DHS data systems. Single Source Entry is a major productivity feature of the system. Another huge productivity enhancement is the adoption of the “meaningful use” standards as defined by the Electronic Health Records protocols. This is not a mere facelift but a new paradigm built on a state-of-the-art platform of SQL Server and Microsoft .NET Framework meeting security requirements as spelled out by HIPAA and EHR. In today’s ever-changing environment, software systems must easily and quickly be able to exchange data securely with multiple stakeholders, county and state systems, providers, consortia lead agencies, and others. A double entry General Ledger system fully integrated with transactions automatically posting costs to the proper account and providing the reports needed for generally accepted accounting practices. The ledger is reconcilable with the county ledger through the chart cross-walk and capable of providing greater detail than the county may need or want. In addition to typical accounting reports, the system also produces required State reports such as CARS, HSRR, Units/Costs and others. A system to manage client's finances, paying and tracking expenses and collecting funds for deposit on their behalf. Single Source Entry of Client Demographic & Service data into local and state systems including name resolver. Worker records Targeted Case Management client contact information, time, costs, program data, and progress notes, rolls up according to MA rules, submits claims for eligible contacts, prepares voucher for posting transaction entries for Financial Ledger. Case management specific to CSP. Case management specific to CCS. Case management specific to B-3. Processes all purchased goods and services invoices, updating authorizations and contracts files, producing electronic transfer of vouchers to county for payment, and creates Financial Ledger transaction entries. Totally new Clinic Practice Management system compliant with Health Level 7 and Electronic Health Records, fully integrated, has appointment scheduling system, complete clinical noting, e-Prescribe, treatment plans, insurance, managing pre-auths, Medicare, and Medicaid claim processing under EDI standards of data transfer between covered entities. 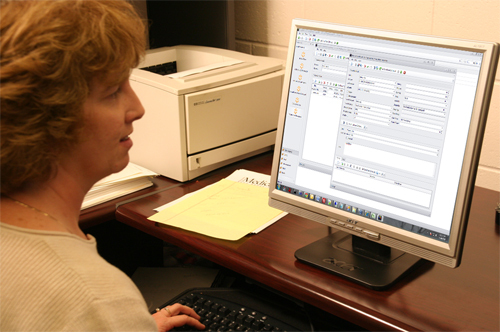 A client billing system which provides monthly statements to clients and aging reports taking into account the Wisconsin Uniform Fee system for Ability to Pay and local policies. It includes receivables collections. Batch import-export of MH/AODA client and service data. Also, reports units data to State PPS. Single Source Entry of Client Demographic & Service data to State for non-Family Care counties still operating with the HSRS system (white counties). Manages CLTS service authorizations to WPS as TPA and to Service Provider, records costs in local system and imports revenue amounts reconciling total transaction. Imports daily service data and monthly check data into local system, transfers check data for county, receives, check data back from county and exports back to state. Fiscal Agent system for clients receiving Home Care Services including State units and costs reporting and related state and federal tax reporting. Custom interface available for most document storage system, permitting access to total retrieval of client data.